Joe Bataan is a king in my world. I'm a HUGE fan of this cat. Been in love with his brand of early boogaloo since my youthful mod days, he's turned my head around like Linda Blair with his unique salsa funk, and he continues to melt me with his 'oldies' sound. 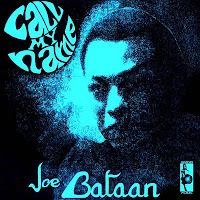 To say Joe Bataan has made some noise within Latin Music would be fair, but rather Joe's been more like a cataclysm, shaping and changing things along the way. He's been down since day one, I believe he started in New York at a very early age, coined the term 'Salsoul', proclaims having the first rap record, and undeniably been responsible for gaining a wider audience for Latin Music. I was first introduced to Joe via a few compilations called, I believe, 'This Is Latin Soul' on Charley's Latin reissue label Caliente. Those comps fed a fire that burned out of control and sent me into a salsa and boogaloo buying frenzy. Joe's records, however, always seemed to hit the hardest with me, and also work on other levels. He never made a boring LP, always mixing it up and even when in the confines of the early boogaloo sound, he always attempted to branch out. This particular album was masterminded by Daniel Colas, who rediscovered Joe, brought him back into the limelight within the loving arms of the rare groove community. Daniel found he was still in the New york area and began to work with him. It's a throwback into earlier years of Joe's sound and although a modern record, it deploys an arsenal of older sounds. In some respects this is easily the lost Joe Bataan record that never was. It's stained with all of the qualities we love and have always wanted from a JB album. Released on the Vampi Soul label in 2005 it re-familiarized everyone with Joe's music. I got reminded of this great album when Joe came to San Francisco recently to perform. Having met him myself I can say he's truly a sweetheart of a guy and full of incredible tales of his life. A true treasure of the music world. Thanks so MUCH! DL'ed it! Thanks for putting it back up...I'm sure folks will enjoy that one. I was after the Potato Salad tune, gonne be sharing that one here in a bit. Thanks again!